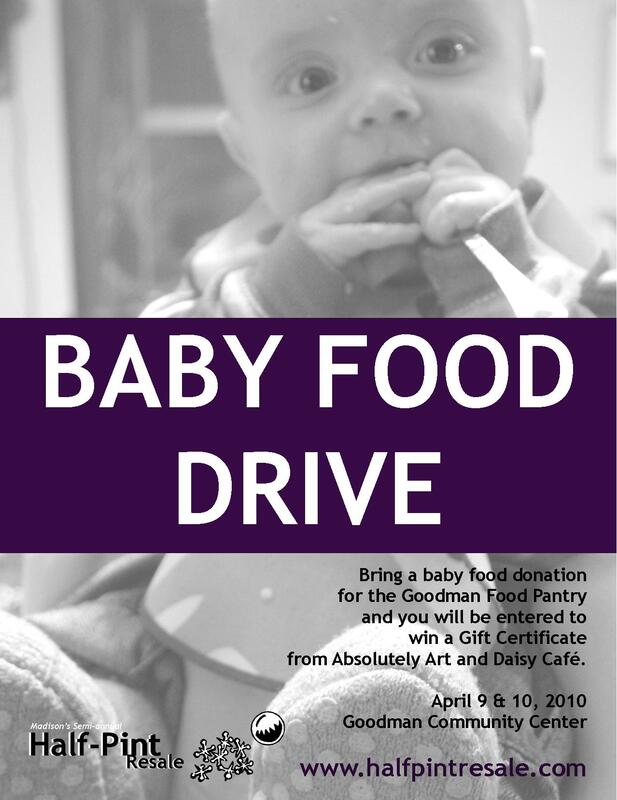 The baby food drive at Half-Pint, benefiting the Goodman Community Center’s Food Pantry, will accept baby food, diapers, formula, and anything else baby. Let’s face it – we’ll accept anything that will help families in need (so all food items) because that helps babies, too! Enter to win one of TWO PRIZES by bringing in a donation to the sale! A $20 gift certificate from Daisy Cafe and Cupcakery and $25 from Absolutely Art, two of our favorite East Side Hangouts (both worth a visit while you are in the area)! If you stop in, thank them for supporting the Goodman Community Center and Half-Pint Resale!